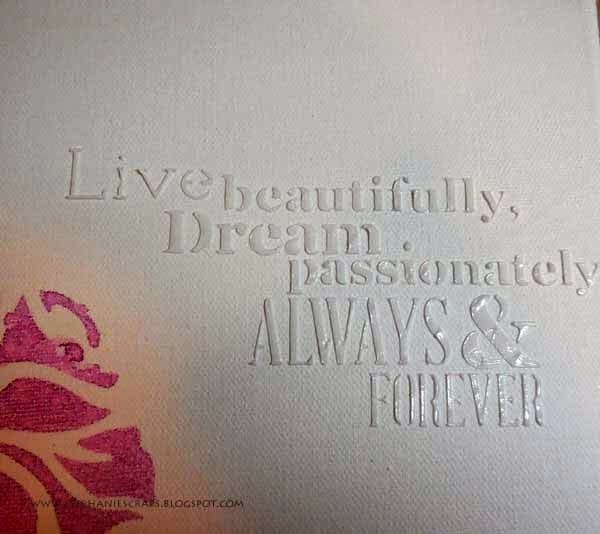 Hi everyone, Steph Ackerman here today using one of the new Prima stencils. 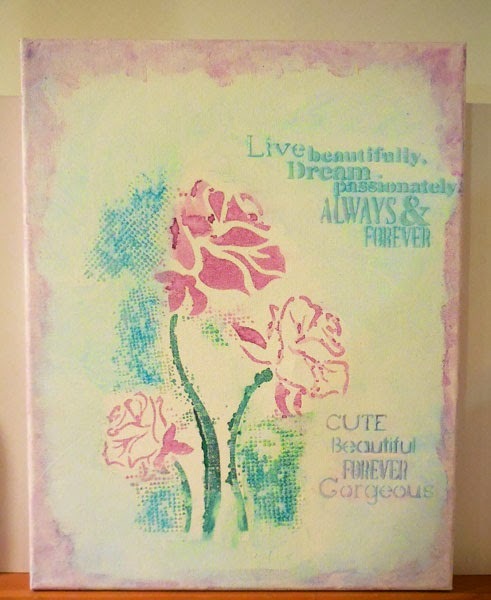 I had tons of fun with this canvas and the focal point is this amazing 12" x 12" Prima Rose Stencil. 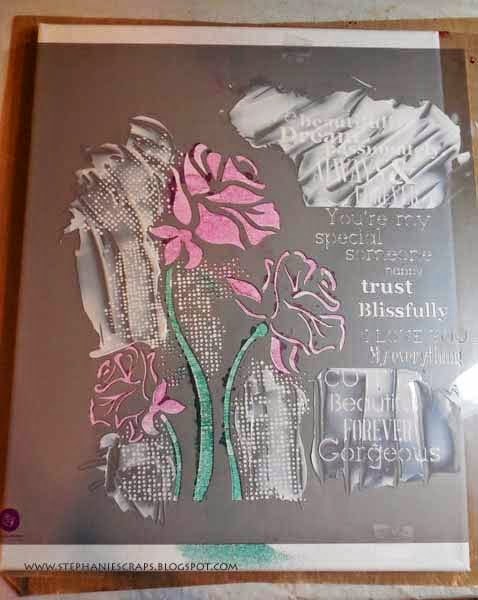 It is much larger than most stencils so I knew it would be a little tough using it on a card, but it was perfect to use on a canvas. Using an 11" x 14" canvas, I taped the stencil in place then got to work. Since I wanted to use assorted colors, I created "masks" before beginning (actually I just tore strips of cardstock and taped them in place). Starting with the roses, I spritzed them with Art Anthology Colorations in Patience. Repositioning the masks, I spritzed Art Anthology Colorations in Peacock Feathers along the rose stems. Don't worry about how it looks at this point because once you remove the masks you will begin to see the project come to life. Removing the masks this was the beginning result. I got some excess colorations along the bottom edge, but no worries, since I had a plan! Once the canvas was dry, I replaced the stencil. Using Modeling Paste, I selected specific word groupings on the stencil and added the paste. 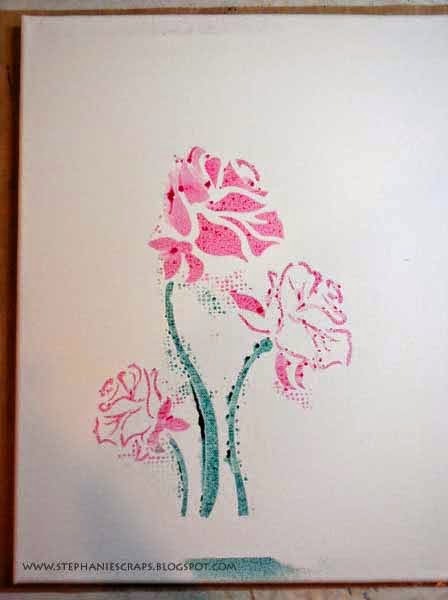 I also used Modeling Paste around the flowers on the tiny dots. I know it's a mess, but not to worry, it cleans up easily. Once the stencil was removed, you get a fabulous result. The 3D effect adds so much to the canvas! Just let the modeling paste dry completely before proceeding. Even without color, the words look pretty amazing. I painted the words and dots with Aloha Art Anthology Velvet Dimensional paint. 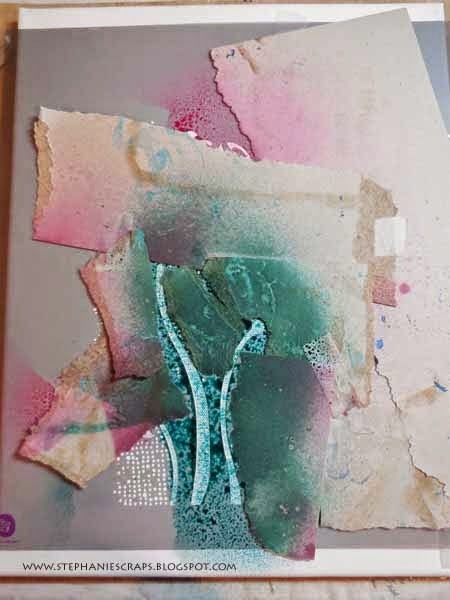 To finish, I spritzed Art Anthology Waimea Bay around the entire canvas panel and then wiped it with a baby wipe to blend the colors as well as move the color around the canvas, getting it into areas that were a little too white. 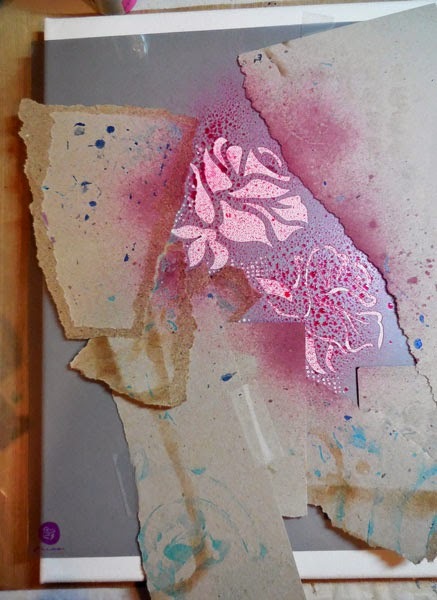 Around the canvas I added Orchid Art Anthology Velvet Dimensional paint with my fingers. I wanted a random, uneven look just to frame the stenciled piece. And it's such a lovely shade of purple!!! Steph, Toni took the words right out of my mouth. Delicate and pretty describe this perfectly. Love the colour palette, the use of white space, and the raised lettering. Lovely! 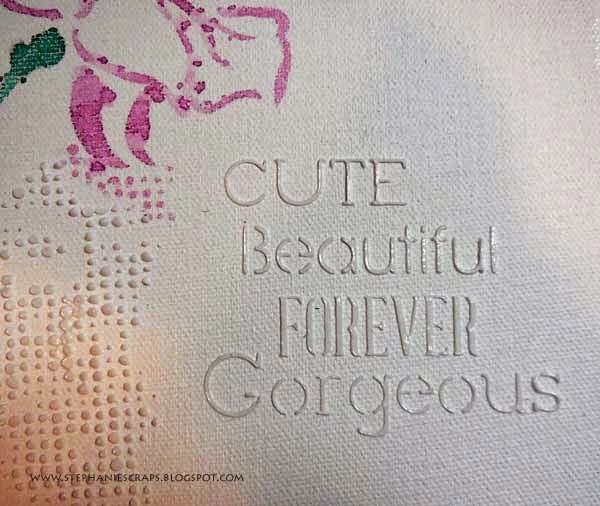 Beautiful soft colors on this Steph - love the look of the white embossing paste for the sentiment! Very Pretty, Steph! One of my personal FAV stencils, too! LOVE your color choice! this is beautiful steph, nice work! This is so, so pretty! I love the beautiful, soft colors! So soft and lovely. Very beautiful.